The St. Louis Cardinals are in a death spiral. By that I mean that, unless they quickly make a number of changes, they will enter a period of frustrating irrelevance like we saw in the late 80s and early 90s or, worse yet, the 70s. Why do I believe the Cardinals are on the road to ruination? In 2016, the Cardinals literally set the record for pinch-hit home runs. And how did the Cardinals reward the coach responsible for getting their pinch hitters ready? Because, he wasn't a Yes Man. Before I got into the baseball world, I spent years in the worlds of consulting and start-ups, seeing and working for both successes and failures. I spent much of my time trying to figure out the difference between under-performing organizations and great organizations. One of the biggest lessons I learned is that great organizations are obsessed with finding and retaining great people. And under-performing organizations drive them out. Why do under-performing organizations drive out great people? They are afraid to hire people who might be better than them. Who might become a threat. And the first sign of that fear? I was once part of a start-up that had some success, but that fell far short of our capabilities. The first hint of a problem was when the head of the organization told me, face to face, "You need to stop asking so many questions and do what you are told." There was some truth to what he said; our promise was that we would provide a comparable user experience on a more powerful platform. The problem was he applied that mantra applied to more than just the UI and to more than just me. In sum, loyalty was valued over talent, and truly great programmers left the company while inferior programmmers, who were part of the in-group, were retained. The product stagnated, sales collapsed, and the company was acquired. I see and hear the same thing when I look at the Cardinals. In particular the valuing of yes-men over those who would ask the pointed questions that can advance an organization forward. I think the root cause of the problem is the much-touted Cardinals Way. In some ways the Cardinals Way is an incredible asset. It can help ensure that things are done the right way. However, when I look at the Cardinals Way, I see an approach that is becoming disconnected from reality. Start with the defensive struggles of the Cardinals in 2016. Clearly, something is broken. However, were the biggest changes that were made targeted at that weakness? They were targeted at fixing what was clearly the LEAST broken part of the organization. The bigger issue I see with the Cardinals is a clear lack of institutional memory; an obvious disconnect between what players in the current Cardinals organization are being taught and what the greatest members of the organization (actually) did. Instead of helping the organization stay on track, The Cardinals Way has become a hammer to be used against anyone who questions the way things are done. Who isn't a yes man. Regardless of whether the way things are done is working or not. What evidence do I have that the Cardinals organization is becoming increasingly dysfunctional. Great organizations retain and promote great people. Dying organizations see them as a threat and drive them away. The 2016 Cardinals' pinch hitters, who Derrick May was responsible for warming up, performed at an incredibly high level. Hell, they set a record for pinch hit home runs. And what was Derrick May's reward? From what I hear, from a prominent former Cardinals player, because he wasn't a Yes Man. I'm not saying that May should have been promoted, but for the organization to not even retain him in his former role as hitting coordinator is absurd. Why does Carlos Martinez so often struggle in the first inning? Why does he trouble making it deep into games? Carlos Martinez is not being allowed to warm up -- and perhaps even practice -- the way he is going to play. At a minimum, when he is warming up before a start, Carlos Martinez uses pitching mechanics that are differe than the one he used up to this point in his career. I'm not exactly sure what's happening or why, but the gist is that Carlos Martinez is warming up using Tall & Fall mechanics but employs Drop & Drive mechanics during the game. This issue first cropped up at the end of the 2015 season when, in-season and just before the playoffs, Carlos Martinez made a significant change to his pitching mechanics and his posture, a change that in my opinion directly and quickly led to his stint on the disabled list. At a minimum, only a fool would change the mechanics of a pitcher mid-season, much less a pitcher who was on an absolute tear and whose numbers were significantly improved from 2014. I see a (strikingly) similar problem with Alex Reyes' stride. What's more, the stated rationale seems logical but is ahistorical. Which suggests that the biomechanic truth is more complicated than Naive Biomechanics believe. Typically, Reyes repeats his delivery well when he stays under control and in a direct line towards home plate. The latter was a particular focal point when working with Springfield pitching coach Jason Simontacchi. That makes me wonder about the level of knowledge of the Cardinals pitching coaches given that, while they seem well-versed in the conventional wisdom, they seem to have little to no knowledge how great pitchers like Bob Gibson (actually) moved. I worked with Tommy Pham from 2010 until late September 2015. During that time, I helped him rebuild his swing and approach. After his August 17, 2015 second call-up, by which time he had addressed most of the flaws in his swing, Tommy Pham hit .303 and put up an OPS of .912. That culminated in a 10-game stretch in which he put up a bit more than 1 WAR in value and, right after which, Tommy Pham ended our relationsip. Which is NOT what bothered me. What bothered me was how, early on in the 2016 season, members of the Cardinals coaching staff started lamenting that their players needed to stop listening to "Internet Guys." What relevance is there to where someone does their teaching? That's as dumb as calling someone Google Boy. Oh and, during the 2016 season, Tommy Pham hit .226 and put up an OPS of .764. It makes no difference where a person does their teaching; whether it's the Internet or a facility. What matters is whether they know what they are talking about or not and whether hitters get better or worse. My concern is that the Cardinals coaching staff seems focused on listening to the "right" people and the "right" things, when the evidence, in the form of Tommy Pham's 2016 season, suggests they may not be "right" at all. A healthy organization, after hearing about my work with Tommy Pham, would say, "Can you tell us more about what you worked on with him and why? Do you see similar flaws in any other players (like Kolten Wong)?" A doomed organization, after hearing about my work with Tommy Pham, would say, "Stop f'ing with our hitters." I instantly loved Matt Carpenter's swing upon seeing him play in 2010, and believe he has (had) a chance to be a perennial MVP candidate and perhaps a Hall Of Famer. Now, I see him having a solid, but only OK career. And that's only if Matt Carpenter's hitting stops declining, which isn't guaranteed. I know that Matt Carpenter isn't doing that badly. However, I would argue that what we saw him do in 2012 and 2013 demonstrates that he has been under-performing. The problem is Matt Carpenter has developed two significant flaws. I would argue that is due in part to the Cardinals coaching stuff buying into the conventional wisdom about hitting. Which is very often wrong. First, Matt Carpenter seems to have become obsessive about keeping his front elbow down. That creates one hole in his swing. Second, he seems to have become more upright and erect when he swings. That has created a second hole in his swing. Some will say Matt Carpenter isn't hitting as well because he is trying to hit more for power than average. However, Albert Pujols was able to hit for both power and average, and I saw the same ability in Matt Carpenter when he broke into the league. However, I would argue that Matt Carpenter is the prototypical example of the problem with hitting instruction at the major league level. A problem that Derrick May sure seemed to understand, given his success with the pinch hitters, but I'm not sure ANY of the current Cardinals coaches understand. I think Randy Flores did a good job with the draft. I don't think Dakota Hudson is a starter, but there were no other glaring mistakes. What bothered me about the Randy Flores hiring was the rationale for his hiring. First, he was touted as having expertise in video scouting. I'm sorry, but that's not a new skill and hasn't been for 10 years. For the Cardinals to think Flores video scouting was an asset is as parochial as being impressed by someone's knowledge of The Google in 2017. The second thing that concerned me about the rationale for Randy Flores' hiring was that he was "familiar with how we do things." While that has some value, great organizations are constantly looking for new points of views and perspectives. Finally, I don't know Mike Schildt. He seems like a nice guy. However, as this video makes clear he has no understanding of what a good swing plane actually looks like. He teaches the same chopping down, A to C swing that has been ruining Cardinals hitters since Joe Mather and before. From what I understand, Mike Schildt isn't the only member of the Cardinals organization who teaches this. It seems to be part of an organization-wide hitting philosophy. The problem is that you could argue -- and I would -- that front elbow down, barrel above the ball, A to C Swing thinking is what's behind Matt Carpenter's under-performance relative to his first two years in the league. You also have to wonder if questioning elements of the conventional wisdom like front elbow down, barrel above the ball, A to C Swing -- which is not what the best hitters (actually) do -- is what led to Derrick May's firing. Matt Holliday isn't with the Cardinals any more, but the problem that led to his struggles through most of 2016 (and 2014 and 2015) and Jhonny Peralta's struggles in 2016 remains; a problem with how the Cardinals teach hitting. This is the same issue I touch on above. As I touch on in Lessons Learned, there are problems with how the Cardinals teach the stride and swing plane that lead to adjustability issues and holes in their hitters' swings. The Cardinals still have a strong core of players to build upon. The big idea behind Moneyball wasn't statistics. The rise of SABRmetrics and analytics has been a boon for the game. However, at the same time that scouting has gotten more objective, coaching and player development is at best standing in place and is more likely losing ground. I monitor what is being taught at the MLB and MiLB levels of the Cardinals and what I keep hearing are ideas that are inconsistent with what the best players to have played the game (actually) did. Including many Cardinals Hall of Famers. Mike Matheny, and other members of the coaching staff's preference, is for Yes Men. It's no surprise, but Theo Epstein apparently hates Yes Men. They are of literally no use to him. He wants people to push back on him and others when they see a problem. The conventional wisdom about hitting and pitching instruction is broken. 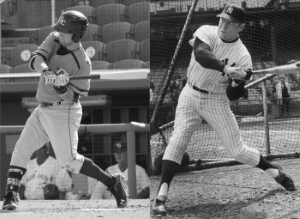 I have numerous examples of this, the most recent of which is a player whose swing was a clone of Mickey Mantle's. He was coached out of this swing (by a now-MLB hitting coach) and is now out of the game. The fact is that hitting and pitching instruction at the major league level is almost universally terrible. By that I mean that, more often than not, players are coached OUT of the movements of the best players. The first organization to abandon the conventional wisdom about hitting and pitching will have a huge advantage when it comes to the efficiency of their player development process. The biggest problem I see is that more and more Cardinals players are being coached OUT of movements that the best players in the organization's history employed. Just today, I read a piece in which a Cardinals pitcher was talking about a directive that, while part of the conventional wisdom about pitching, is NOT at all what Bob Gibson did. The number one thing that worries me about the Cardinals is what seems to be a complete lack of institutional memory. Yes, people talk about the organization's past glories, but in most cases players are being coached OUT of, not into, what those great players did. Bob Gibson literally changed the game. MLB had to lower the mound to (try to) reduce his dominance. The only other player who I can think of whose impact you can see in the rulebook was Ty Cobb, and that was because of the way he played the game and all of the crap he pulled. I would argue that, whenever a Cardinals coach or player is talking pitching, the first thought that should enter their mind is this one. Given Bob Gibson's success, I would argue that, if you are coaching a player out of what Gibby did, that's a problem. Stan Musial had a swing that, in many ways, was a product of his era and not as applicable to the modern game. However, there is one thing that modern hitters -- like Matt Adams -- can learn from Stan Musial. While modern hitters are being told to stand up for leverage, that is not at all what Stan Musial did. Perhaps, if Stan Musial did something, it was a good thing, not a bad thing? There is another player in the organization's more recent history, about whom a similar question could and should be asked. What did Albert Pujols do? Given Albert Pujols' success as a member of the Cardinals, I would argue that, if you are coaching a player out of what Albert did, that's a problem.